Entering a shark’s domain comes with an inherent risk, as a diver off the coast of Guadalupe Island, Mexico learned in terrifying fashion. New video documents the surreal scene of a Great White shark lunging after a piece of tuna bait, before slipping inside the diver’s cage and thrashing around violently. The harrowing encounter lasts a few seconds, only before the shark swims out of the cage with blood gushing from its mouth. 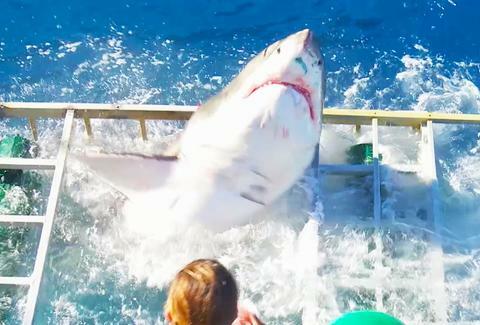 Luckily, that blood came from the tuna, and not the diver who was trapped inside the cage with the gargantuan predator. As Gizmodo notes, the video was posted to the YouTube account of Gabe and Garret -- a channel that documents the adventures of two young boys from California. Luckily, the kids weren’t anywhere near the shark, as their father indicated in the video’s description. While totally terrifying -- the video shows someone from the boat crew opening the cage door, so the trapped diver can escape the perilous situation -- the video’s caption depicts a slightly calmer scene. Although rattled, the “very experienced diving instructor” was totally fine after contending with the panic-inducing event.